Eric Fowler was shot dead in Blanchardstown last night. GARDAÍ FROM BLANCHARDSTOWN are investigating after a man in his 30s was fatally shot yesterday evening. This afternoon they appealed in particular for information about a car used during the incident, which was later found burnt out. The shooting happened at around 6.50pm in the Blakestown Cottages area of Blanchardstown. When gardaí arrived at the scene they found the body of the victim – 34-year-old Eric Fowler – in the driveway of one of the cottages. Fowler lived and worked in the area, and was the CEO of a car valeting company. He’d been shot several times, and was pronounced dead at the scene. The area was sealed off by gardaí for technical examination, and the state Pathologist was notified. It is understood the fatal shooting may be gang feud-related. Blakestown Cottages is the area where hitman Imre Arakas was brought when he arrived in Ireland last year contracted to carry out a killing, and gardaí are said to be investigating any possible connections to ongoing the Hutch-Kinahan feud. Speaking to reporters at the scene, Superintendent Liam Carolan said an incident room had been set up at Blanchardstown Garda Station, as a murder investigation is now underway. Carolan said that retaliation is a possibility but that a strong garda presence would be visible in the coming days and weeks. Carolan said the man's family are "traumatised" by his murder, especially as it came so close to Christmas. They want to speak to anyone who was in the vicinity of Blakestown Cottages, Blakestown Road, Hartstown Park and St Peregrines GAA Club yesterday between the hours of 5pm and 7pm. Any drivers who travelled the Blakestown Road between 5pm and 7pm, particularly those with dash cams, are urged to come forward. They’re appealing to trace the movements of a silver Volkswagen Jetta, with the registration 06 – MH – 3192 from 18 December until 7pm last night. This car was found burnt out at Rusheeney Crescent in Clonee, Dublin 15 at 7pm. 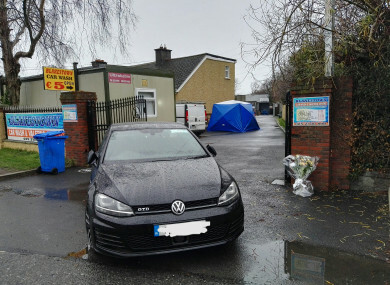 Gardaí are appealing for anyone with information of seeing people fleeing from this car or any other suspicious activity in the Rusheeney area in the days leading up to the murder to get in contact. Gardaí in Blanchardstown have appealed for anyone with information to come forward by calling 01 666 7000, the Garda Confidential Line on 1800 666 111, or any garda station. Email “Gardaí appeal for information about car used in west Dublin shooting ”. Feedback on “Gardaí appeal for information about car used in west Dublin shooting ”.